Ben is lead game designer (or “Games Mechanic”) at Melbourne’s premiere live games company, Pop Up Playground. He has designed dozens of games for and with the company, including Spy Catcher, The Curse, #TrueRomansAll (commissioned by Bell Shakespeare’s Mind’s Eye program), 1000 Cities (for City of Melbourne), The Ride and their first “elsewhere room” project, the immersive bank heist adventure Small Time Criminals, set in a real two-storey bank building. 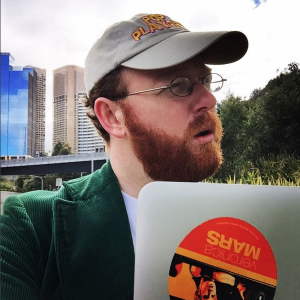 Prior to Pop Up Playground, Ben created several improvised comedy formats, including Set List (with Karin Muiznieks and Daniel Walmsley), Macguffin (with Sean Fabri) and Dungeon Crawl (with Richard McKenzie). He’s also worked on the Freeplay Independent Games Festival since 2011, and spoken on panels at both Freeplay and PAX Australia. He occasionally writes about games at Losing An Eye on Medium, and on the Pop Up Playground blog. In 2012, Ben contributed to Magpie Games’ Our Last Best Hope, a storytelling game of heroic sacrifice and humanity-threatening disaster. The Companion book introduces a variety of new ways to play it, including Ben’s rules and guidelines for playing the game as a comedy. He also contributed some ideas for the main rulebook. The game is available on DriveThruRPG and through the publisher’s web site. He currently has several tabletop games in early stages of development, and runs game design workshops (among other things) with school children at 100 Story Building in Footscray.